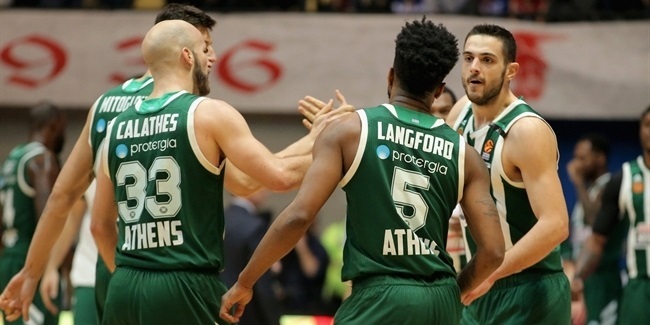 Not only did Panathinaikos Superfoods Athens register a resounding 28-point win against visiting Real Madrid, but its record-breaking playmaker Nick Calathes earned the MVP honor for Game 1 of the Turkish Airlines Euroleague Playoffs. Calathes launched Panathinaikos to a 95-67 triumph with a performance index ranking of 29 while setting a EuroLeague Playoffs record with his career-high 16 assists despite sitting out the entire fourth quarter. Calathes needed less than 26 minutes to add 11 points on 4-for-6 two-point shooting and 1-for-2 from beyond the arc, while collecting 6 rebounds, a steal and 2 fouls drawn. Othello Hunter had a career-best performance while helping CSKA Moscow take a hard-fought 98-95 home win against Khimki Moscow Region. In just his fourth start of the season, stepping up for injured center Kyle Hines, Hunter had 18 points while making 5 of 6 two-pointers and 8 of 8 free throws. He added 8 rebounds, 2 assists, a block and 6 fouls drawn for a PIR of 28, his best in 121 EuroLeague games to date. Mike James of Panathinaikos helped his team rout Madrid with game-highs of 24 points and 8 rebounds, good for a PIR of 27. James hit 7 of 11 shots inside the arc and 3 of 3 from downtown, adding 3 assists, a steal and a foul drawn. The fourth-highest PIR of Game 1 belonged to Brandon Davies of Zalgiris Kaunas, who had a career night in his team's 78-87 overtime road win against Olympiacos Piraeus. The EuroLeague rookie posted career highs with 21 points, 8 rebounds, 3 blocks and a PIR of 26 as Zalgiris pulled out its first EuroLeague Playoffs victory this century. Wrapping up the list of Game 1's top performers was CSKA's Sergio Rodriguez, who scored a playoffs career-best 25 points on 5-of-8 three-point shooting and had 5 assists, 2 rebounds and 1 steal for a PIR of 24. Olympiacos Piraeus veteran Vassilis Spanoulis led all scorers for Game 1 with 25 points, his playoffs career high. Will Clyburn of CSKA led all players in Game 1 with 9 rebounds. Calathes set a EuroLeague Playoffs record and his own career high by dishing 16 assists. Matt Janning of Baskonia and James Nunnally of Fenerbahce shared the top spot in steals for Game 1, each with 3 apiece. Brandon Davies topped the Game 1 charts with 3 blocks. 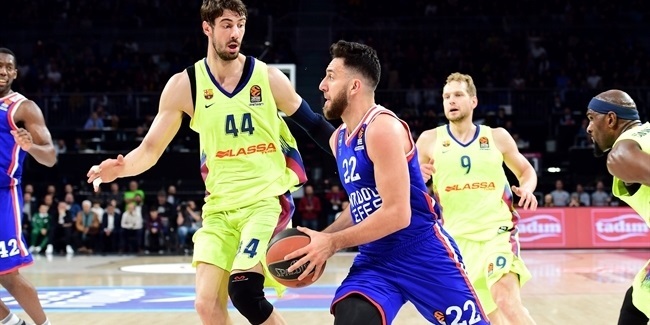 Two players had double-doubles in this season's playoffs openers: Calathes (11 points, 16 assists) and Kostas Sloukas of Fenerbahce Dogus Istanbul (10 points, 11 assists).